Leland Barker’s tan, lean figure attests to the fact that a diet of lots of fresh vegetables and locally raised mountain trout contribute to a healthy lifestyle. 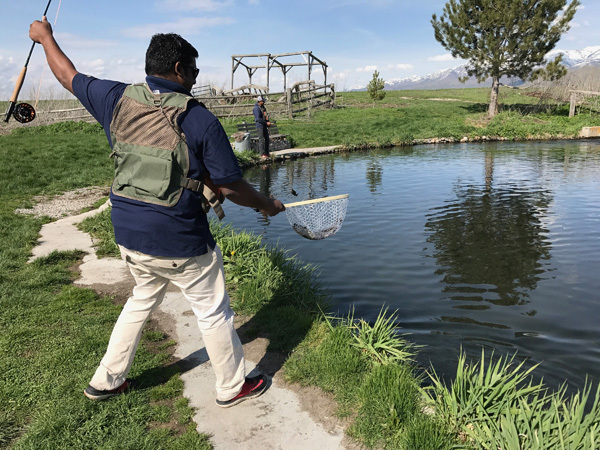 Just four years ago, he added the sport of tennis to his already busy life as owner and acquaculturist at Mountain Valley Trout Farm in Smithfield, Utah. Now, he wins tournaments across the United States. The Barkers bought the 55 acre fish hatchery from the Erickson family about 21 years ago. Leland, born in 1957, grew up working with his grandfather, Lyman Barker, father, Ward Barker, and brother, Jay Barker, at Cold Springs Trout Farm in North Ogden. He worked there for 20 years before getting his own farm. Tennis isn’t the only thing Leland is good at. When he took over, he developed Mountain Valley Trout into a fee fishing and farm operation, producing 30,000 pounds of trout a year. 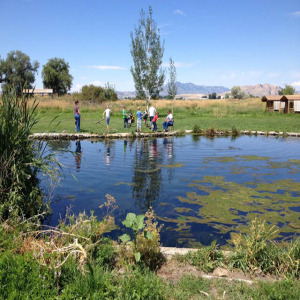 The trout are sold to a few local restaurants and a Salt Lake wholesaler, to the local community at the Cache Valley Gardener’s Market and to a variety of fishers—dads and moms with their kids, a scout troop with their leader, or a number of guys just out for a relaxing afternoon of fishing. You don’t need a license to fish at a private fish farm. A small number of fishers practice catch and release and the remainder catch to keep. All fish that are kept are meant for human consumption, and you may have your fish cleaned and filleted before you leave. A customer may also drive to the farm and request a certain number of fish, and a young biologist or other hatchery employee will net the fish fresh from the raceway and process them while you wait. The water for this trout farm comes from natural springs on the property, and from some flowing wells. The temperature of the water, at 60° is ideal for raising trout. The types of trout that can be found here are Rainbow, Brown, Brook, Tiger, Splake (a combination of Lake and Brook) and Blue Rainbow. The appeal of trout is their beauty both in the wild and on the plate ready to eat. In wild trout the color of the meat is slightly pink, but in farm grown trout, a pigment is added to the feed to produce a deep peach color. 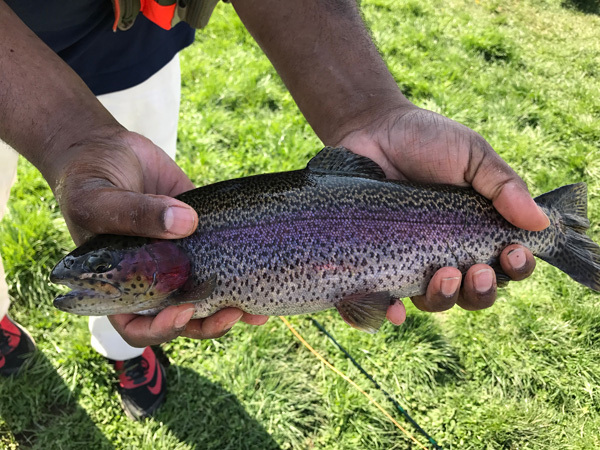 Jordan Owens of North Logan nets a nice Rainbow trout, and his friend, Carlos Morales fishes separately in the background. Cooking trout is as easy as pan frying in butter with chopped onions, a little garlic salt, lemon pepper and some type of all-purpose seasoning. Or you can do as Leland’s wife does and add a crushed Saltine cracker coating and seasonings. Then go out to the garden and harvest the fresh vegetables to round out the meal. In a little while, get back to playing tennis. Hours of operation: March 15th – October 15th, Monday through Saturday Noon – 8:00 p.m. October 15th – March 15th on Saturdays, Noon – 6:00 p.m.
For prices or for appointments and other questions, call 435-563-3647.